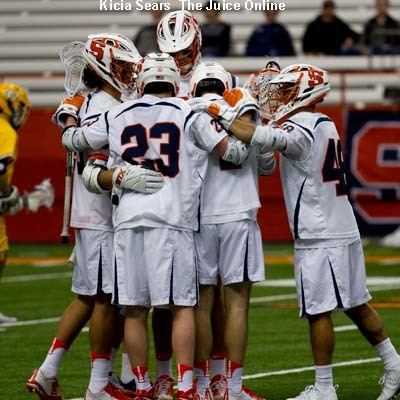 The Juice Online: Can Syracuse keep up the pace of winning one-goal games? Eamon McAnaney: They’re playing great teams. You can’t complain about winning close games. Everyone’s doing it. There’s really no one, really, outside of a couple of games for Duke, where anyone really looks good. It’s tough to get a read on Denver because they’re playing lesser competition right now. It’s certainly better than the alternative – winning one-goal games as opposed to losing them. But, I get the point: They’re skating on thin ice. I don’t think it would be the worst thing in the world for Syracuse if they lost a game this weekend down in Durham and got a clean slate going to the NCAA Tournament. That’s obviously easy for me to say. John Desko would never say that, but they’re balanced. They’re finding ways to win. They’re battle tested. They won that Carolina game, a big part of it was because they’ve been through the wringer every week from the get-go of the season. TJO: What’s been the difference for Syracuse this year? 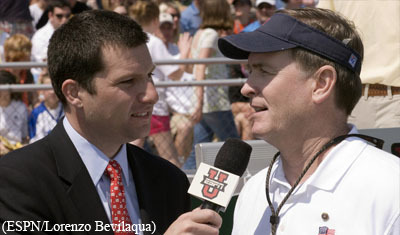 EM: Duke and Syracuse have the most established goalies who have been through this before. Syracuse, once they made the switch to Evan Molloy, they’re a completely different team. They switched last year after the Notre Dame game and I think the only reason they didn’t make the Final Four last year is because some early season losses gave them a tough seed against Maryland. They were not the eighth-best team by the time the NCAA Tournament rolled around, but they got a tough seed because of some tough losses. So, Evan Molloy has been your biggest difference. It’s hard to say that [Nick] Mariano’s been a difference, because he’s been good for a while, but the way he and [Sergio] Salcido have been playing makes it very difficult to defend because teams are forced to double-poll the midfielders. That allows the Nate Solomons of the world to do some damage, or whatever attackman you’re putting a short stick on. So, the 1-2 punch of Salcido and Mariano has been another difference for them. 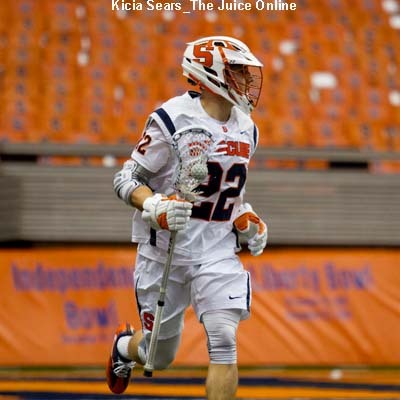 TJO: Should Syracuse be concerned about the recent play of Ben Williams at the X? EM: Yes. Because if and when you get to a matchup against Duke, or even a matchup against Denver, you want to be able to dominate that matchup, and you’re not going to. He’s been such an X-factor for them when he’s healthy. You can almost count on winning the possession battle. Let’s be honest, that’s why they beat Albany in a one-goal game, because they dominated the faceoffs. You look at Denver and Duke, two possible teams that you’re going to have to beat to win the championship – there’s a lot of wear-and-tear on these guys. The Carolina matchup, Stephen Kelly is not the same player this year that he was last year when he was the engine. Those guys log a lot of miles in a grinding position, and I think Ben Williams is beaten down. Can he get recharged for a post-season run? Of course. But I think if you’re a Syracuse fan, you should be a little nervous he’s not going to be the 60, 65 percent guy that [Denver’s Trevor] Baptiste is, for that [Kyle] Rowe may be becoming for Duke. TJO: What are your predictions for the ACC Championship? EM: Well, whoever lost in the regular season is going to win this weekend. The rematch always goes to the guy who lost. I think Carolina finds a way to beat Syracuse because they are the more desperate team. I think the fact that Carolina has to go there and win out gives them an added edge that Syracuse will have a hard time matching. I think Duke beats Notre Dame because they’re playing at a better level right now. They’re a more complete team than Notre Dame. But I think Duke beats North Carolina at home on Sunday.